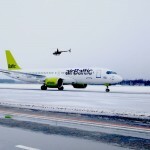 The first airBaltic operated, freshly delivered Bombardier commercial aircraft CS300 has arrived to Riga International Airport Wednesday, November 30, 2016. 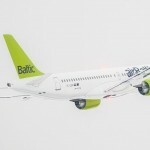 Latvian flag carrier becomes the launch operator for CS300 — the larger variant of Bombardier’s all new C Series aircraft, which is designed to carry 145 passengers. 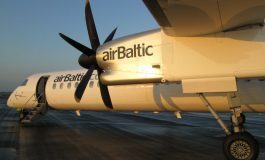 The maiden flight of airBaltic’s new bird, which will take passengers from Riga to Amsterdam, is scheduled for December 14, 2016. 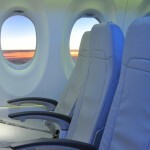 Passengers will be able to enjoy unparalleled comfort in a single-aisle cabin — according to Bombardier, thanks to aircraft’s larger seats, overhead bins and windows that all deliver a wide body feel. 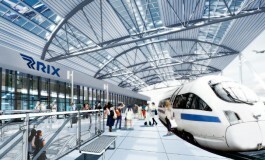 New aircraft is also much quieter – with four times smaller noise footprint. 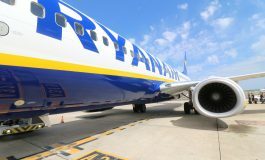 Moreover, at the moment, it is the greenest commercial aircraft in the world, as it is the first aircraft to have a transparent declaration of the life-cycle environmental impact, helping to reduce CO2 and NOX emissions by 20% and 50% respectively. 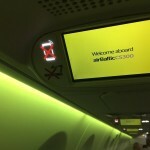 airBaltic is has ordered 20 CS300 aircraft altogether. Based on the list price of the CS300 airliner, this firm order is valued at approximately $506 million US. We are thrilled to be taking home the first CS300 aircraft – the newest member of the most innovative and technologically advanced family of airliners in the world.